It’s rumoured that Harry Styles is planning on getting a huge new tattoo, large enough to cover his whole back. It is said that he wants to cover his back as he feels that he has too many tattoo’s on the front side of his body. The One Direction singer already has a large collection of tattoos scattered all over his arms and chest. He is right about his tattoos mostly facing to the front or semi front or sideways. So now, he’s planning to get one humungous tattoo that will cover his entire back. The pop singer got his first ink in 2012 by Freddy Negrete, a Los Angeles based tattoo artist who made the tattoo designs in the movies “Blade” and “Bound By Honor”. Style’s first tattoo was a five point star, representing each band member of One Direction. Since then Harry’s body collection has grown, with designs including a large butter fly tattoo on his chest and the famed ship which he got with former girlfriend Taylor Swift. A huge tattoo is a serious project to tackle with, “The whole thing could take months” the Shamrock Social Tattoo Parlour artist says. He also mentioned that Harry prefers a Hebrew themed design. Style’s have a Hebrew text of his sister Gemma on his left arm. “Harry will probably have more Hebrew lettering. He already has his sister’s name in Hebrew on his arm and he loves it … He talks right through [being tattooed] and is always joking.” He added. 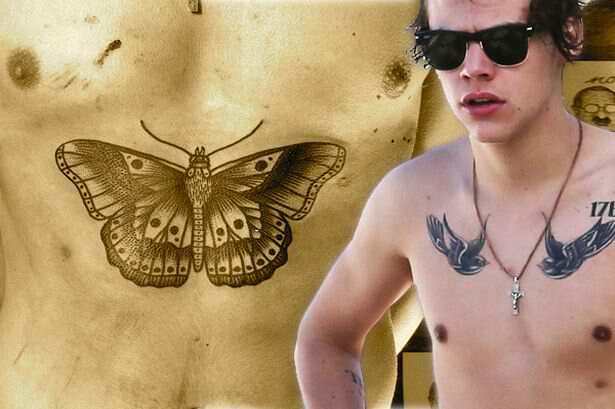 While Harry may be a tattoo lover, his mother Anne Cox is against the inkings.